Battery life is the life of a smartphone, so it needs special attention. One aspect that must be considered in order to smartphone battery longevity is the quality of the charger . Well, this time Jeff will share how to distinguish charger original with a fake. If it turns out the default charger is broken and you intend to buy a new charger, be careful buying fake charger is priced at a bargain price! Although the result of the use of counterfeit charger rarely felt directly, but in some cases there can be immediate consequences. For example, the default charger is equipped with the technology of fast charging , while using fake charger then the filling process becomes slow. Due to the slow charging then result in a temperature rise and trigger the smartphone battery bloating , until finally broken. When you want to buy a new charger, always carry adapter charger your smartphone. The goal is to equalize the design until all the numbers listed in the adapters his. Also do not forget to equate the structure (shape) of the port USB in adapter her. If you are observant, you will find a noticeable difference between genuine and counterfeit charger. 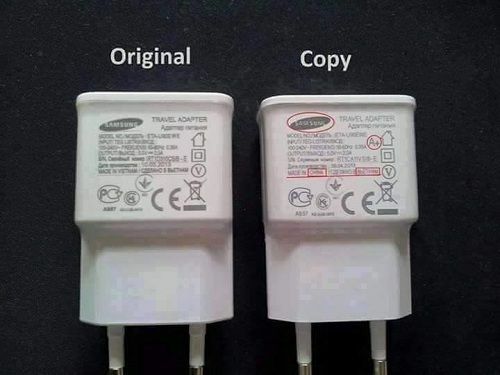 Many differences can be seen in adapter charger original with a fake. Starting from the design, the shape of the plugs (usually false leaner without detail), until the text color. To check the authenticity of charger you buy, especially on Samsung smartphones and iPhone are becoming more crowded with the fake charger. Ampere is an application that will calculate the amount of power that goes into smartphones when in- charge . So, to find out if you’re real or fake charger, immediately download the APK Ampere . After Ampere installed, you only need to start recharging smartphones. Then see how much voltage and current into the smartphone. As soon as the results came out, immediately equate with that written on the head adapter charger . If it turns out much different voltage numbers (in the bottom half of the voltage value is written) then you are obliged to suspect that it was a fake. Especially if it turns out the resulting current is also weak. Besides adapter charger , you also need to pay attention to your smartphone built-in USB cable. Because only used to recharge the battery, the smartphone USB cable can also be used to transfer files from a smartphone to a computer . If the USB cable you bought turned out to be false, besides not optimal in to recharge the battery, it will certainly affect the transfer of files between your computer and your smartphone. To distinguish the original USB cable with fake ones , you have to pay attention to the thickness and length of its USB plug. Usually fake charger is equipped with a USB socket that is longer and thicker with a darker color. As technology advances, shopping even easier, just shopping online only. 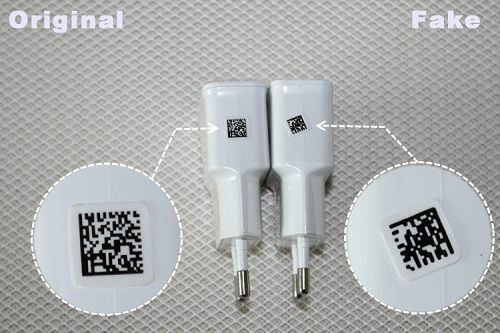 Well, how to distinguish between genuine and fake charger mentioned above certainly can not be used when shopping online . To avoid purchasing counterfeit charger, we recommend that you buy a charger in places or official store. Some official store has a site or service online for shopping with guaranteed genuine goods and provide warranty. Not only to the problem charger, price is always a powerful weapon to lure consumers. Be the smartphonesmart by not easily tempted by a cheaper charger prices, but offer features wah. Be aware that many of the components in the charger that is supposed to safety , stability and durability, are removed to reduce the selling price of a charger.